I have an upcoming game in early October in Montreal with the usual suspects. Since I let Iannick pick the scenario the last time, I convinced him it was my turn. My French friends are usually more keen to game the central European theatre, rather than the Peninsula or Waterloo. But it is only fair that I get to field les rosbifs every now and then. I wanted to do a Waterloo scenario, but I am still working on my Prussian Corps as well as my Hanoverian Brigade. Just was not ready, but I will be soon. I have a fair sized Anglo-Portuguese force with almost 3 complete divisions done. These are essentially the first figures I painted 6-7 years ago now and they are certainly a little rough. They do represent my early attempts at painting and are my history in the hobby. I have already re-organised my French from 16 figure battalions to 24 figures with le chef du batalion on a separate base. Now it was time to bite the bullet and get the British done. I had already made some earlier changes, but the colonel was still based with the flag and the two standards were on different bases. 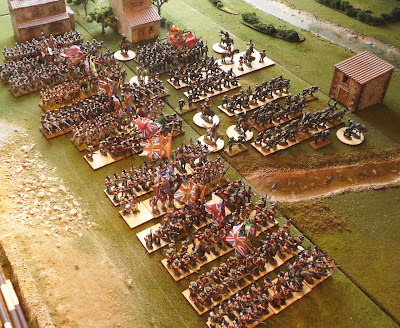 I lot of re-terraining was needed as well as the loss of some units as the painted figures had to be moved around to supplement the bigger units. I additionally needed to paint 8 Cacadores as well as 3 Lights and 7 Line infantrymen. Well I got 14 painted in 2 days, with just 4 left, it was not as bad as I thought it might be. These figures are much better painted then the originals in their battalions, but that all adds to the charm of each unit. I have also hopefully enticed my 16 year old daughter to do the basic terraining for me. She is an art student and enjoys working with paints and materials, she also will enjoy the $2 per base she has been offered. I just hate terraining! 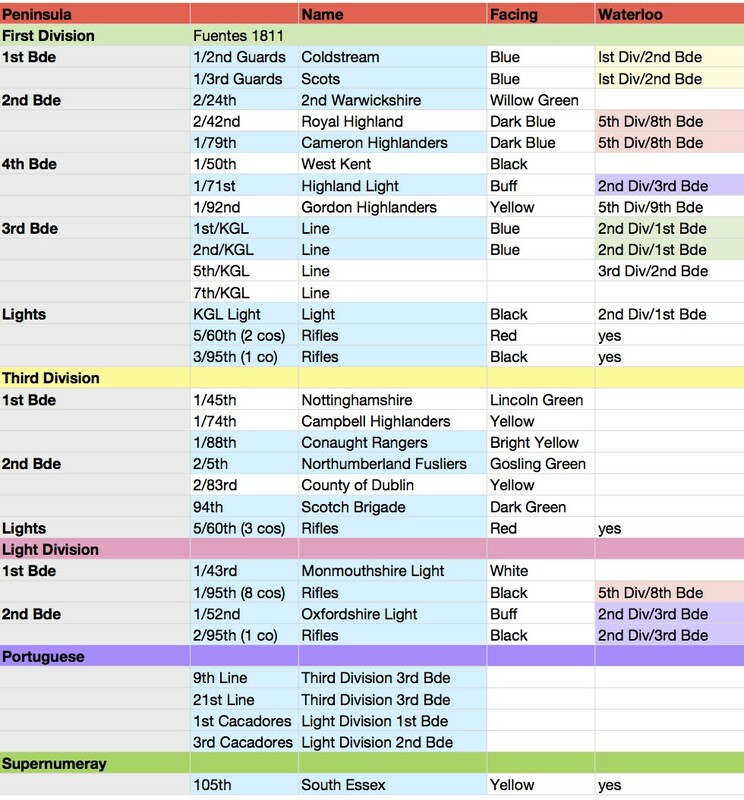 So at one time, I had completed almost all the battalions in 3 infantry divisions who served in the Peninsula. If you look back to my first post in this blog (remember it was originally called Wargaming Fuentes de Oñoro), I had planned the original project around the 1811 Order of Battle. 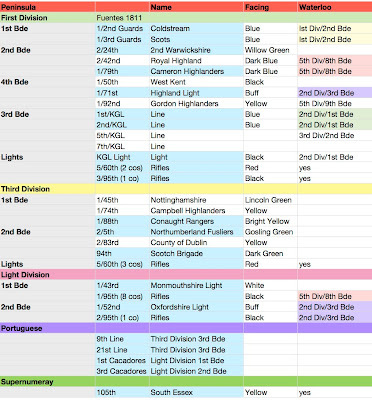 It is amazing to think I almost accomplished it, with the only unit not done being the 92nd Gordon Highlanders. Those kilts will always kill you. Well goals change, the 100 Days campaign started to interest me, so like all wargamers I drifted. Drifted into the Prussians and the Hannoverians, and have barely resisted the Brunswickers. I also know that the Dutch-Belgians are in the future, as who can resist the lure of Quatre-Bras! Well here is where I am, once the terraining is done. Not bad I suppose. Really just 6 units (the ones not highlighted blue) to do, as the South Essex will always figure into some OB. It is a pity that not all of the units served at Waterloo. If I have missed something in respect to this below, please point it out. Well here we have them, the scum of the earth, as Wellington used to call them. As you can see there is still a lot of terraining. 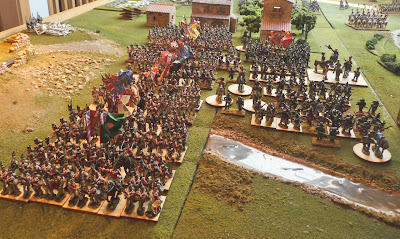 The large command stand represents Picton and the rounds stands are various Brigadier Generals. That is a weird river, it just ends. Are not the standards absolutely glorious. We see 2 GMB in the foregound, followed by 2 Flagdude and the last is a specialised Maverick flag for the South Essex. I am going with all Flagdude, if only I can get him to answer my emails. That's a lot of paintwork there, John! Wellington's Peninsular army has to be my favourite. Great work. What brand figures did you use? I think I see some Elites? Stupendous work, John. Very, very impressive and a great achievement. I especially like the second last photo as it gives an great impression of the mass of troops. Rosbif, The 52nd and 43rd are both elite, although I would have gone with Perry's if they were available at the time. 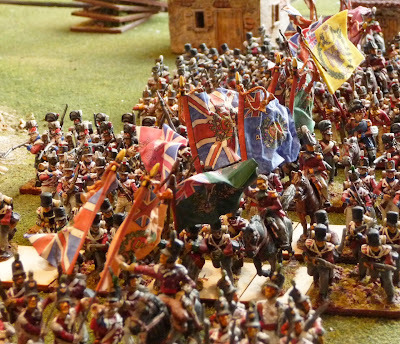 There is a mixture of FR, Foundry, Perry, Elite and a couple of Redoubt and Victrix officers in the collection. Really mongrels. Curt, It is hard though to get her to do it, beating went out in the late 19th century.